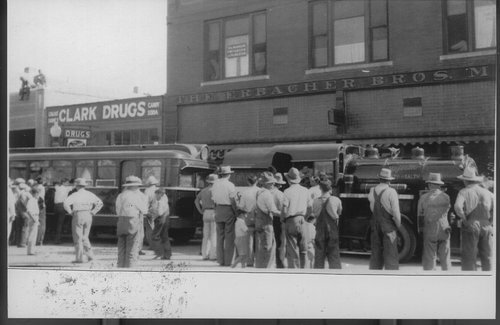 A photograph of people standing on a business street looking at a promotional train car and truck designed to look like a railroad locomotive in St. Marys, Kansas. On the truck locomotive are the words Majestic National ____ Health. It is parked in front of Clark Drugs and The Erbacher Bros buildings.